Veronica was a courageous woman. And she was as compassionate as she was courageous. Perhaps more so. She broke through the hostile crowd and defied the hateful soldiers in order to wipe the face of Jesus with her veil. 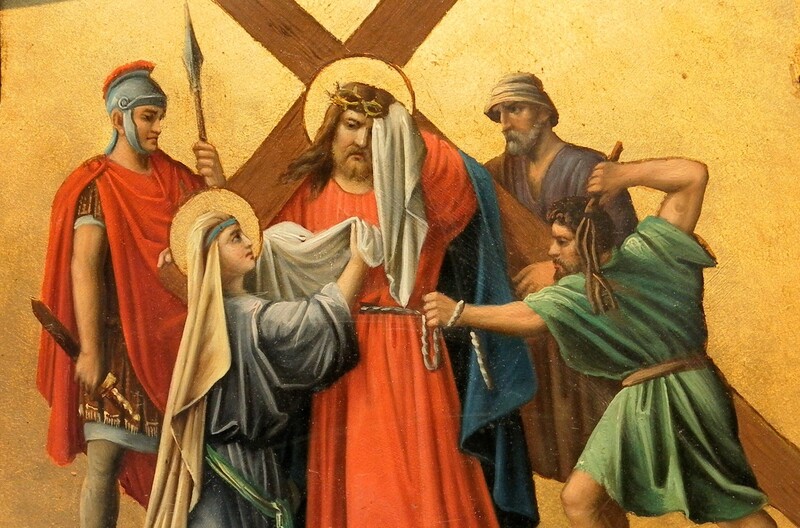 That Holy Face, covered in sweat, blood, spit, and dirt, moved Veronica to become one of the heroines of the Passion narrative. She forgot about herself and reached out to relief the suffering of another human being. She extended mercy to Divine Mercy himself and in return, he left the image of his Holy Face on her veil. That’s what we’re called to in this Year of Mercy. We’re to seek God’s mercy for ourselves but then also extend that same mercy to others. Before we can truly, purely extend mercy, we have to be accepting of mercy ourselves. The fact that we ourselves have been recipients of mercy will make us even better givers of mercy. If you think back on your life, you’ll see countless examples of times you were shown mercy – directly by God and also by other human beings. Think about those times and give thanks for them. Thank the heavenly Father for his mercy and spend some time meditating on how it has changed your life. Your gratitude will urge you to extend mercy to others. Like Veronica, you’ll be able to forget about yourself and reach out to someone in need of mercy. Poinsettias in Lent. Ridiculous? Maybe not.